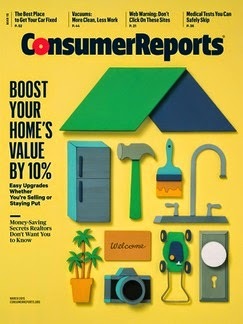 Recently Consumer Reports surveyed more than 300 real estate agents throughout the country to determine the most effective ways for homeowners to increase the value of their homes. I agreed with most of the findings and encourage home owners to read it before deciding on their next home improvement project. There are many things that can be done make a home more appealing to buyers and it’s not always necessary to spend a small fortune to get top dollar from the sale of a home. According to the study 53% of the agents agreed that the kitchen was the most important room to spruce up before showing a home to prospective buyers; 42% felt that the bathroom should be the first consideration. I know from experience that these are the 2 rooms of the house that buyers seem most interested in and should look their very best before any showings are permitted. It was interesting to note that 64% of the agents also stated that almost of their buyers searched for homes online before contacting an agent. This is important because it tells sellers that when they decide to sell their home they should find a tech-savvy agent that is capable of marketing their home on the internet. The days of simply placing ads in the local paper just isn’t the way things get done any more. Another very important point to consider from the survey was the importance of not overpricing a home when placing it on the market. I was quite surprised that only 43% of the participating agents considered this to be the biggest mistake that a seller could make. I have seen this happen many times and there is no doubt that an overpriced home will virtually sit forever. Today’s consumers are more educated than ever before and most are well aware of the asking price of homes for sale in their area of interest. The report includes many other interesting and valuable tips for homeowners as well and is worth reading whether you are selling your home or simply want to make the most of your investment dollars. Other topics include the top 5 ways to increase your home’s value, how to make your home look it’s best online, advice on upgrading the appliances in your home and much more. You can view the entire report at “How to Make Your Home More Valuable”.